If you have been injured in a construction accident and you believe someone else was at fault, do not wait to seek legal assistance. Contact Simpson Law Group. You may not have seen this tragic story from a few weeks ago, but we want to bring it to your attention. A 28-year-old father of three daughters was killed with he fell from a roof and struck his head while working at a San Diego commercial property. His death is currently being investigated by the Occupational Safety and Health Administration. There is no doubt that construction workers face considerable danger on a daily basis. The nature of their work puts them around situations and equipment that most others do not encounter in the workforce. The men and women who work in construction keep our country going. They provide services that are invaluable, from keeping our roads and bridges going to building our homes and offices. But what happens after an accident? If you need a San Diego construction accident attorney, you can turn to the Simpson Law Group. 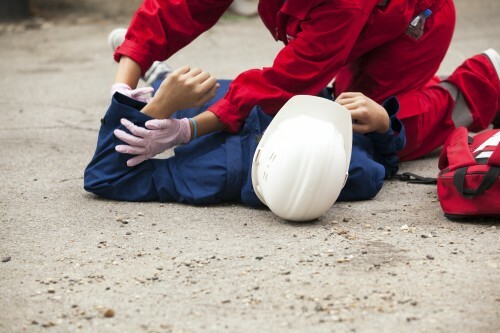 Construction accidents and injuries happen for a variety of reasons, many of them revolving around someone else’s negligence. When it comes to construction fatalities, OSHA has what they called the “Fatal Four” which is the top four ways construction workers are killed on the job. So many construction accidents, injuries, and deaths are preventable, but someone has to hold the people who cause them accountable. Construction companies have a duty to supply their employees with the equipment they need for their job. They should provide each employee with proper protective gear: shirts, pants, gloves, eyewear, headgear, and respiratory protection. They should also have harnesses available for every worker who will work while raised above the ground. If a company fails to provide the proper equipment, they are being negligent in their duties. Safety is the most important factor in construction. From the moment an employee is hired, they should be provided with safety training. This training should be continuous and ongoing for all employees, from overall construction site safety to proper safety procedures for each piece of equipment a worker will use. It does not matter how long an employee has been in the industry – they can benefit from safety training. If you have been injured in a construction accident and you believe someone else was at fault, do not wait to seek legal assistance. Workers’ compensation may not cover all of your expenses and you may be entitled to more. We know that medical costs will be high, but you may not receive enough to cover your lost income. How can someone who lives paycheck to paycheck get by after an injury? At the Simpson Law Group, we will stop at nothing to get you the compensation you deserve. For a free consultation of your case, you can contact us by clicking here or calling 619-236-9696.